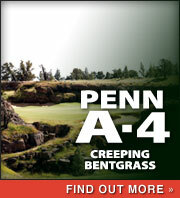 Penncross has set the bentgrass standard since 1955. It has a medium green coloration and has rapid establishment. It is known for its aggressive, lateral growth habit and wide range of adaptability. Penncross has excellent resistance to dollar spot as well as other diseases. 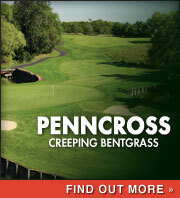 After 50 plus years, Penncross is still the most specified and most widely used and trusted bentgrass in the world. Along with providing a smooth surface for putting greens, its aggressive lateral growth and ability to recover quickly makes Penncross a great choice for use on tees and landing areas. Penncross is exclusively a first-generation cross of three vegetative clones, which are planted by hand in Oregon. The parent material, developed by Dr. Musser, is still maintained at Penn State University, where it is not allowed to flower, and vegetative stolons are air expressed to Oregon, to plant new fields of Penncross. Penn A-4 is dark green with fine leaf texture, exceptional heat and cold tolerance, high density, disease resistant and aggressive growth habit. It provides a smooth grainless putting surface. Penn A-4 will also provide a good playing surface for tees and fairways. It is proven to be adaptable to various conditions. Dr. Joe Duich developed these new Penn bents from plant selections that exhibit dense, upright growth, fine leaf texture and the ability to tolerate low cutting heights as well as high heat and humidity. Today, the A's and G's are recognized as some of the finest bentgrasses ever produced for putting greens. The A's and G's provide a consistent, virtually grainless putting surface that adapts easily to raising and lowering of cutting heights, allowing superintendents to manage green speeds without worries. Dense-tillered and upright-growing, the A's and G's need less fertilizer, less water and less fungicide applications. Thanks to their deep roots, they more effectively tolerate low mowing, heat, humidity, cold, disease and wear. Tyee possesses a bright, dark true-green color, not a blue green like many of the new creeping bentgrasses. It maintains this color through extreem weather including the heat of summer. The color is uniform and provides an appealing contrast with othe rgrasses in the faiway. Tyee, like many high density bentgrasses used for greens (Penn A-4) requires more extensive management for thatch control, including top-dressing and verticutting. 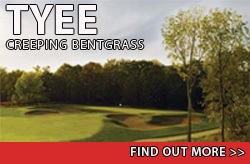 The rewards from using Tyee are a superior putting surface, reduced syringing, less herbicides, and reduced thatch production when compared to other high density bentgrasses.